Patients with ESRD consume a vastly disproportionate amount of financial and human resources. Approximately 0.03% of the US population began renal replacement therapy in 2004, an adjusted incidence rate of 339 per million. Declining incidence rates were observed for most primary causes of ESRD and in most major demographic categories; the worry is that rates of diabetic ESRD continue to rise in younger black adults. Although diabetes and hypertension remain the most commonly reported cause of ESRD, rates of end-stage atherosclerotic renovascular disease seem to be on the rise in older patients. Although clinical care indicators, such as the proportion of hemodialysis patients using fistulas, continue to improve gradually, the proportion of patients overshooting target hemoglobin levels under epoetin therapy may be a source of concern. Survival probabilities have improved steadily in the US ESRD population since the late 1980s, which is remarkable when one considers the ever-expanding burden of comorbidity in incident patients. However, although first-year dialysis mortality rates have clearly improved since 1987, meaningful improvements do not seem to have accrued since 1993, in contrast to steady annual improvements in years 2 through 5. Although most of these findings are grounds for cautious optimism, the same cannot be said for issues of cost; reflecting the growth in the size of the ESRD population, associated costs grew by 57% between 1999 and 2004 and now account for 6.7% of total Medicare expenditures. The growth of research in the arena of chronic kidney disease (CKD) has been dramatic. For example, a PubMed search performed February 6, 2007, using the terms “chronic kidney disease” or “CKD” yielded 1985 and 2473 citations, respectively, in humans for the years 2001 and 2006. Although we believe that this is a good thing and have no reason not to doubt the maxim that “prevention is better than cure,” it remains the case that ESRD consumes a vastly disproportionate amount of resources, both financial and human. An otherwise similar pair of searches with the terms [maintenance or chronic or long-term or end-stage renal disease] and [dialysis] produced 1735 citations in 2001 and 1741 citations in 2006, suggesting that research in the arena of ESRD has not kept pace with that observed with chronic kidney disease (CKD). Although these patterns are encouraging, especially in an era in which one of the major risk factors for renal disease, type 2 diabetes, has reached epidemic proportions,3 several new years of data will be required to determine whether real population changes have occurred. Nevertheless, this is an encouraging pattern, and it is tempting to speculate that improvements in preventive care, such as use of angiotensin-converting enzyme inhibitors and angiotensin receptor blockers, and enhancements in glycemic and BP control may have contributed. This being said, that the population of the United States continues to grow tends to suggest that the size of the RRT population will also continue to grow unless incidence or survival rates fall. 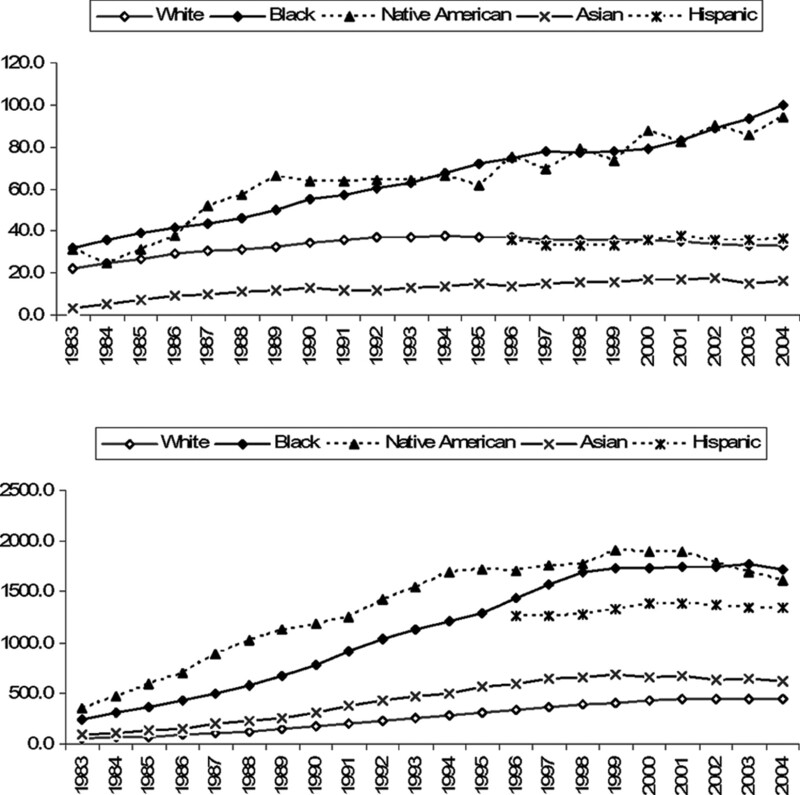 With regard to specific subgroups, this pattern of stabilized or declining adjusted incidence rates was apparent in all age groups; both genders; and white, Hispanic, black, and Asian subgroups; incidence rates remained unchanged from 2003 to 2004 in Native Americans after 4 successive years of declining adjusted incidence rates. The decline in incidence rates in the black population is particularly noteworthy, because event rates in this demographic category are typically three times those of the national average. Although a major public health challenge still remains, these findings are cause for optimism because 2004 was the second calendar year in which a decline in incidence rate was observed in black individuals, the other being 1999. Diabetes remained the dominant primary cause of incident ESRD, with reported rates of 148.8 cases per million in 2004. Figure 1 shows adjusted rates of end-stage diabetic renal disease by race and ethnicity in selected age bands of the general population, namely 30 to 39 and 60 to 69 yr. In both age bands, it is apparent that disease rates vary substantially according to race and ethnicity. Among younger adults, rates have declined in white individuals since the early 1990s and remained constant in those designated as Asian and Hispanic, whereas rates have continued to rise among black individuals and Native Americans. Among older adults, rates seem to have stabilized in the past 5 yr in all racial and ethnic groups, although disparities remain marked. Although the underlying basis for these findings remains unknown, increasing rates of diabetic ESRD in younger black adults is a cause for concern and suggests a looming public health crisis. For hypertension, the second most common cause of ESRD, incidence rates remain considerably higher in black individuals in all age groups. However, annual trends suggest a flattening of the growth curve in all age groups and in all races. Rates per million per year (adjusted for age and gender) of diabetic ESRD by race and ethnicity in selected age categories. (Top) Ages 20 to 29 yr. (Bottom) Ages 60 to 69 yr. The primary data underlying these figures are available as PowerPoint slides and Excel spreadsheets at the web site of the United States Renal Data System (USRDS, www.usrds.org). The figures presented in this article were generated from data contained in these spreadsheets. The characteristics and comorbidity profiles of patients starting RRT have continued to evolve annually. Diabetes remains the dominant comorbid condition. For example, among white patients in 2004, 45.9% had a primary diagnosis of diabetes at initiation of RRT, 3.9% had a secondary diagnosis, and an additional 16.2% had a diagnostic claim suggesting diabetes during the first year of therapy, a total of 66.0%. For other racial groups, the corresponding proportions were as follows: Black, 44.7, 5.2, 16.4, and total 66.3%; Native American, 76.4, 2.2, 7.5, and total 86.1%; Asian, 49.8, 3.0, 14.0, and total 66.8%. Clinical impression and the increasing age and cardiovascular disease burden of new dialysis patients suggest that atherosclerotic renovascular disease (ARVD) may be an emerging condition of importance in this population. Surprising, little observational research is available to test this hypothesis, and temporal trends regarding the epidemiology of atherosclerotic renovascular disease in the dialysis population have not been well characterized. We recently used the USRDS data set to identify ARVD and revascularization procedures in patients aged ≥67 yr at dialysis inception between 1996 and 2001 by using diagnostic Medicare claims.4 The proportion of patients with ARVD before initiation of dialysis therapy rose from 7.1% in 1996 to 11.2% in 2001. Approximately 15% of these patients underwent revascularization. The prevalence of previous ARVD and renal revascularization exhibited considerable geographic variation. Of note, the seemingly rising burden of ARVD in older patients starting dialysis therapy was not reflected in the proportion of patients with renovascular disease listed as cause of ESRD on the Medical Evidence Report at dialysis inception, which remained static at approximately 5.0%.4 These findings suggest that ARVD is becoming more common in older patients beginning dialysis therapy. The initial laboratory findings in patients starting RRT have also changed considerably from year to year. For example, comparing 1996 and 2005, initial hemoglobin levels rose from 9.3 to 10.2 g/dl, blood urea nitrogen fell from 94.0 to 83.3 mg/dl, serum creatinine fell from 8.5 to 6.8 mg/dl, and estimated GFR rose from 7.7 to 10.1 ml/min per 1.73 m2. If one assumes that these variables reflect treatment of nondialysis CKD, referral practices, and acuity of renal functional decline, then these findings suggest that some progress has been made in the past decade. Not unexpected, given that diabetes is the cause of ESRD in more than half of the incident population and the epidemic levels of obesity in the general population, body mass index at inception of RRT has increased considerably during this timeframe, from 25.5 to 28.2 kg/m2. There were 472,099 prevalent RRT patients at the end of 2004, with the following distribution: Hemodialysis, 65.6%; renal transplantation, 28.9%; and peritoneal dialysis, 5.5%. A total of 60,393 were on the renal transplant waiting list, a figure that is approximately double that seen in 1997. Among incident patients in 2004, 94,891 (91.4%) began RRT with hemodialysis, 6686 (6.4%) with peritoneal dialysis, and 2260 (2.2%) with a renal transplant. Figure 2 shows annual trends in these counts. Although hemodialysis patient counts have increased year by year, incident counts for peritoneal dialysis have declined annually since 1995. Transplantation as first mode of RRT continues to exhibit rapid growth; absolute counts, however, remain modest. Incident patient counts by treatment modality. HD, hemodialysis; PD, peritoneal dialysis; Tx, transplant. Clinical care indicators have continued to improve gradually in the ESRD population. Figure 3 illustrates current proportions of dialysis patients meeting selected general population preventive care guidelines and dialysis-specific National Kidney Foundation Kidney Disease Outcomes Quality Initiative (K/DOQI) targets. Although hardly grounds for complacency, these indicators suggest progress and future challenges. Percentages of dialysis patients meeting general population preventive care and Kidney Disease Outcomes Quality Inititative (K/DOQI) targets. Among prevalent hemodialysis patients, data from the Clinical Performance Measures Project showed that 36.3% used fistulas as dialysis access, 25.5% used catheters, and 38.2% used grafts in 2003. The corresponding figures in 1998 were 27.8, 17.1, and 54.7%. Thus, the encouraging growth in fistula use has offset graft use, whereas catheter use remains an unsolved problem. In parallel, although hospital admissions for vascular access–related infections seem to have stabilized in the past 3 yr, the rates of these events remain disturbingly high, with estimates of 132.3 admissions per 1000 patient-years in 2004. The year 2006 was notable for the publication of large trials assessing various hemoglobin targets under epoetin therapy in patients with CKD. In aggregate, these trials suggested that higher hemoglobin targets may be dangerous.5–7 Thus, concern is emerging that overshooting recommended hemoglobin targets may be dangerous in dialysis patients, as may highly variable hemoglobin levels. Achieving hemoglobin levels >11 g/dl is almost routinely feasible in current hemodialysis populations. Among patients who achieved this level with epoetin therapy between July 2004, and July 2005, the 6-mo cumulative probability values of exceeding hemoglobin levels of 12, 12.5, 13, 13.5, and 14 g/dl were 0.96, 0.88, 0.76, 0.58, and 0.41, respectively. It has also become clear that hemoglobin levels in US dialysis patients vary considerably over time. For example, among patients receiving epoetin on January 1, 2004, 23.0% had hemoglobin levels <11 g/dl, 47.4% between 11 and 12.5 g/dl, and 29.5% >12.5 g/dl. Among patients with levels <11 g/dl, hemoglobin categories 3 mo earlier were 36.5% <11 g/dl, 43.6% between 11 and 12.5 g/dl. and 20.0% >12.5 g/dl; for the other two categories of hemoglobin levels, the corresponding figures were 20.1, 53.5, and 26.4% and 18.7, 40.6, and 40.7%, respectively. Although the contributions of intrapatient and extrapatient factors are unknown, the findings of excessive overshooting and hemoglobin variability may be a cause for concern. Mortality rates per 1000 patient-years, adjusted for age, gender, and race in incident hemodialysis patients. Overall, hospitalization figures have remained relatively static at approximately two admissions per year per dialysis patient, accounting for approximately 14 hospital days per year. However, the attributed causes for these admissions seem to have changed. For example, hospitalizations for vascular access have declined substantially, possibly because a greater proportion of procedures are being done in outpatient settings. In contrast, admission rates for bacteremia and septicemia have exhibited a biphasic pattern with declining rates for the years 1997 through 2001 followed by increasing rates in 2001 through 2004. Medicare and non-Medicare costs for ESRD have climbed to $20.1 billion and $12.4 billion, respectively. The most recent estimate suggests annual Medicare costs of $68,000, $49,000, and $24,000 for hemodialysis, peritoneal dialysis, and transplant patients, respectively. The cost of ESRD in the United States continues to accelerate greatly, with a growth in Medicare costs of 57% between 1999 and 2004, to the extent that the ESRD program now accounts for 6.7% of total Medicare expenditures. Prevention and treatment of ESRD are difficult. Despite their inherent difficulty, many of the trends observed in the USRDS tend to generate cautious enthusiasm for the future, apart from the issue of costs, which continue to skyrocket. In addition, ESRD represents the tip of a very deep iceberg of CKD, one that is likely to deepen as a society ages. The interface between CKD and ESRD, which is very poorly understood, remains an unmet public health challenge.